A former SNP deputy leader and pro-independence heavyweight attacks the Yes campaign's incoherence, striking "a hammer blow to Alex Salmond". With Alex Salmond having made clear his desire to see a second question on “devo-plus” included on the ballot paper when Scots vote on whether to become an independent nation, further divisions emerged over the weekend with an attack on the Yes to Independence campaign from a former SNP deputy leader. 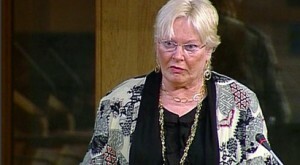 Speaking to Scotland on Sunday, Margo MacDonald, now an independent MSP, argued that the idea of a second option featuring on the ballot paper should be dropped altogether, as it would need the approval of English as well as Scottish voters and politicians. “It’s got no shape, no boundaries, no premise. In short, I don’t think we’ve had a debate, I think we have had a lot of noise. Her comments come just weeks after Patrick Harvie, the Scottish Green Party’s co-convenor, took a swipe at the Yes to Independence campaign, arguing that it had effectively been hijacked by Alex Salmond and the SNP. Meanwhile, following last week’s revelations from Scottish Labour that SNP ministers and officials have not had a single discussion about the consequences of independence with any of the UK’s ten major government departments, the Herald reported this weekend that Whitehall – concerned that the SNP administration is dragging its heels on the issue – is considering taking control of the referendum. “Such a move would be fraught with political danger as it would leave Mr Cameron open to accusations from Nationalists that he is trying to hijack the process they feel is Holyrood’s preserve. Best news ever and independence absolutely guaranteed, even if he arranges for Princess Kate Middleton to have twins the day before. You’ve cheered me up. Thank you. BTW…it should be remembered, firstly, that Margo is a bitter against Alex, because her husband fell out with him many years ago and backed Margaret Ewing for the leadership… when that campaign failed, both Margo and her husband flounced off out of the party in a huff. Margo now sits as an independent in parliament. Secondly, the Yes campaign is run by the yes campaign, and not by Alex, any more than Cameron is running the Tethered Together campaign. The next point I’d make is that if David Cameron is getting himself involved because some bitter woman is having a go, I have to say he has learned little about statesmanship in the last two years when he is supposed to have been practising it. I realise he will never have heard of Jim Sillars or Margo MacDonald…a bit parochial for him, but he should read up on it before he gets involved. The SNP wants full independence; always has, always will. There are people within it, I suppose that don’t, but the vast majority do. However, the government has run a Consultation with the Scottish people and we await the outcome of that. All opinion polls in Scotland have shown that more people want Devo Max, than want independence, status quo, or direct rule from England. It is possible, even probable, that the consultation will, therefore, also show that that is what the Scots want. No decision has yet been taken by the Scottish Government on the form which the constitutional referendum question or questions will take. This is a matter to be submitted to the Scottish Parliament for a decision in the course of the process of legislating for the referendum after analysis of the numerous responses to the Scottish Government’s pre-referendum consultation has been completed. As for the question of negotiating the terms of independence with the UK government, that is something which the Scottish Government would expect to do AFTER the referendum if there is shown to be a majority in favour of independence. Really? So you think fraud is acceptable, noted. Do it David, you can’t lose. The jockos are just dying for you to ask them. Margo never left with Sillars. She was an SNP MSP up till the 2003 election. Her decision to leave was down to Salmond, Swinney and Sturgeon trying to force her off the Lothian List for that election by pressuring SNP party officials to get shot of her as she was critical of their leadership of the SNP. She left the party with legitimate disgust at their under handed ways, and won her seat back as an independent on the same list. Also Margo MacDonald, is someone who commands widespread respect for the lack of bitterness and animosity that she shows towards other politicians, of all backgrounds, working well with all in Parliament and out with it. There is, as Patrick Harvey has cited (http://www.bbc.co.uk/news/uk-scotland-scotland-politics-18763175) no clear definition of Devo-Max. Salmond believes it to be something totally different from what Henry McLeish sees it as, and he in turn sees it differently from Neil Findlay and the ‘Red Group’ in Labour and then they all view it differently from Jeremy Purvis and the Reform Scotland group. So how can we have a vote on something which has no substance or design, and is just noise. We need an alternative in a multi-option referendum which is as solid an idea in where we are going as independence, or we have a vote between independence, the status-quo and ‘devo-max’. The idea is a consolation for Salmond. We were lead to believe in Scotland up till 2011 that the independence referendum was to be straight in/out, yes/no. It was to be what was proposed in 2010 by the SNP from the 2007 election manifesto. They achieved power again, with a majority, and began to announce the idea of Devo-Max. This was a clear move for Salmond not to go down as the SNP leader who lost independence, like Bloc Quebecois in Canada did on a couple of occassions, but to give him an opt out. All power short of elements of macro-economics, foreign policy and defence. In short, to give him fiscal control of all Scottish taxation and control of every other aspect of Scottish life, at least it was that to him. The Unionist parties, or as I think we should call them the ‘Devolutionists’, were thrown off guard by this, as you would be by a man who since he was in politics has wanted total independence, and have taken time to regroup. Further devolution is fine, and will come if we vote NO in a referendum, as it is clear that all parties in Scotland want more power in Holyrood, even the Tories do. More fiscal responsibility is what we need, more power of elements of our welfare policy is also needed. But that is a debate over devolution. Independence is a different debate, and the combination becomes muddied. As if you argue for devolution you will always come across the SNP going ‘but with independence…’ so it’s an unusual, and frankly, cynical move by Salmond to go here. He was elected on a manifesto which in print says a vote on independence, that was what his last 3 year consultation gave us up to 2010. Now he wants a plan b, a safety net for him and his party. That’s playing politics with our future as a nation. If he is a conviction politician with a belief that he can win this vote for an independent Scotland then he should go for it all guns blazing. There’s no shortage of people who would support him Patrick Harvey, Colin Fox (SSP), Margo MacDonald, Jim Sillars etc, all ‘well kent faces’ up in Scotland. But he seems to be moving to some strange, vague plan of nothing really. I agree, Cameron should NOT take control of this, but Salmond shouldn’t be running all this either. It’s our future as Scots together. A special committee of the Scottish MPs, MSPs, Lords and members of Civic Scotland to form the bill and the rules of the process, along with the detailed time table up to the ‘big day’ in 2014. It should also be left to the Electoral Commission to form the question (as they have on all UK referenda since they were formed). What is clear is this is an issue which is too big politically and culturally to be left to one government, or parliament. Both are attempting to rig it. We want more power, the debate the SNP want, and have got the chance for, is on independence, NOT more devolution and what form that should take. If we Scots say NO in 2014, then we all come together for a new devolution settlement (and the need for that in Northern Ireland and Wales is clear too) in the UK. If not and YES, as surely Salmond wants, wins the day, then we ‘devolutionists’ wipe ourselves down and get on with the job we all need to get on with, and make Scotland a better country than the one we find today. Tbh, you’d think they’d have had discussions with Government departments over how a post-independence vote Scotland would want to conduct its negotiations. Especially considering the SNP are so sure on how the defence estate, national debt, pensions liabilities, national boundries at sea and liability for decomissioning of Faslane and North Sea Oil when it runs out would be split post-YES vote. Yet that hasn’t and until it happens all we get told will be assertion. If there’s a “no” vote, then the mandate is certainly NOT for any further transfer of powers! You mention the Bloc Quebecois…whose demise is a wonderful warning story of over-reach, they’ve been replaced with more moderate left wingers. If Scotland was to be stupid enough to vote No, then the Tory revenge will be to strip Holyrood of power, continue asset stripping petrochemicals resources, minimise expenditure on Scotland and leave the entire country passive housing estate, debased, ‘consumers’, existing on handouts and purchasing English goods. So what powers will come, exactly, and when will they come? Yesterday we found out not even the Crown Estates are being devolved, and that’s a no brainer. A “no” vote is currently massively more uncertain, undefined and vague than either independence or devo-max is. It depends on which party gets in after the next UK election, whether they remember Scotland exists, and whether they genuinely want to transfer more powers of punish us for daring hold a referendum. I agree there should only be one question, which is the SNPs preferred position too. However the consultation suggests many people want devo-max or more powers and any government should be willing to listen to what people want. On that, the Scottish government scores far higher than Westminster and it’s three parties.